~ The young lion Hiromu is looking to show his skills against the Charasmatic Junior in Kanemoto. This will be coming up to Hiromu’s 10th month as a pro wrestler and he is looking to start making his name recognizable. No one better to either showcase your growth as a wrestler than against Kanemoto who is both technically sound and a veteran of the ring. Hiromu shows strides of fighting spirit in this match and even hits Kanemoto with some solid blows. Kanemoto is not that easily held back though as he shows Hiromu that is still a bit too green in certain areas. A descent match to start off the show with only a few minor skips by Hiromu, but in the end shows some growth by the young lion. ~ The match has a shocker before it even starts as Rabbit is taken out Jado, Gedo, and the surprise of Brian “Spunky” Kendrick taking Rabbit’s place in the match (Gedo clearly called him spunky, ha). KUSHIDA gets some fan love at the start of the match, which was great to see and hear. 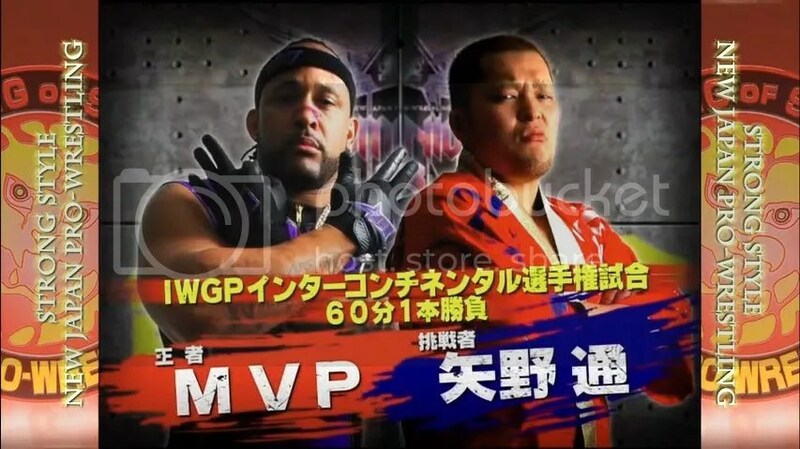 This was a descent match all and all, Kendrick seemed to be on point though not competing in Japan in the last few years and Gedo and Liger seemed to have had some unfinished business between themselves. Nothing new was really brought in the match, but it was descent in the execution of mainly building something up for KUSHIDA vs. Kendrick to happen one on one sooner than later. ~ The fans in attendance where behind both competitors in this match with two guys who in their own right can have some solid matches when they need to have them. Both guys can work the technical game and both can take to the air when need be. This match was pretty good I thought, with Dorada even falling pray to a huge rope slip and that he somehow managed to get up from. He gets points for being able to get up and continue competing. The fans continue on right behind Dorada and this match came out to be pretty descent. A surprise finish to culminate a descent match and I thought this played out well considering the spot that could have cut this match short. ~ You got to love the ,atches that the crowd realy get behind. Osaka is always the place to really hear and see people who love pro wrestling in Japan. There was not a moment in this match where the crowd was not behind someone in the match. From the opening moments of Iizuka attacking the announcer and Nagata making the save to Tenzan against Iizuka and Nagata vs. Tanaka. This was another descent match and definitely keeps the show moving along and a good pace. Also the surprise return of a former young lion was really unexpected and set up a future match that is scheduled to take place in July. Pre-Match Build~ Tetsuya Naito and Yujiro Takahashi, former best friends and former allies as “NO LIMIT”, have went from being as close as can be to bitter rivals in a little over a month. Takahashi there for the longest seemed to be falling behind in Naito’s shadow, but following the Dontaku 2011 show Takahashi finally seemed to be pointing that the split was happening. Though during the first night of the BOSJ Tournament on 5/26. Takahashi finally laid Naito out and said that “NO LIMIT is Over!”. Takahashi still remains in CHAOS while Naito has been left completely on his own and without anyone behind him. After all the years of playing heel it sort of tends to come back on you. Naito will have a lot to prove to gain the trust of anyone in the NJPW roster, but right now all he really has on his mind is Yujiro Takahashi and exacting some revenge on his former friend. Naito got an early start on his path on the 6/10 NJPW BOSJ Finals show when he appeared and took out Takahashi with a Jumping Elbow. Following the assault Naito demanded a singles match against Takahashi. ~ Two of the main contenders to be called the next generation Heavyweight Champions in a match that should be an early statement for one of the two. Naito of course had his early singles breakout last year while Yujiro was not so lucky. This year Yujiro aims to take the ball and run with while making sure Naito is the one left in the back. This match was alright and was a good point in this feud in the year to come. Naito of course is labeled as the “speed” ands Yujro as the “muscle”. Though really to me Yujiro has a ot of work to do to become a believable Heavyweight “size” wise. I have always felt he sat right on the line of being a Junior/Heavy. While Naito stacks up next to Tanahashi very well and has the Heavyweight potential already in his favor. This match had some solid moments and so misses as well, I still enjoyed it in the end. It will be great to see how well these two will stack up in the upcoming years as they eventually do grow into their positions in the company. ~ Pre-Match Build: These two are far from strangers as they just met back in January for the Wrestle Kingdom V show. Of course you can see who came out the winner, but Ibushi it has been quite some time in the making for him in terms of becoming one of the best junior heavyweights in Japan. Ibushi has been touted for years as being one of the brightest and greatest of the new wave of talent, and after being the first “real” outsider to win the BOSJ tournament, now there is no time than ever to carry that momentum in solidifying his name with gold. Devitt though is 2-0 over Ibushi, in major matches, with-in the last year, stemming from beating Ibushi in the BOSJ Finals last June and then the earlier mentioned Wrestle Kingdom V match. Devitt is the most over wrestlers in NJPW and has held the IWGP Junior belt for almost a year and has defended it a total of 7 times, with this match being his 8th defense. ~ So to say the least these two should put on an great showing. Lots of big moves and lots of action in the ring. Both guys matched up very well and Ibushi especially showed that he has learned from working with Devitt in the past and vice-versa. Both guys put on a great match with only a one serious spot at a miss, but oh did it look brutal. Counters after counters, dives, top rope moves, but in the end there seemed liked there could have been a not more from these two. Possibly a bit more time. Granted a 4+ hour show needs to have things cut from it. Though after seeing this match the second time I am fighting to what score I wish to give this right now, but I can also alter it later on the 2011 List. But compared to their previous encounters last year at the BOSJ and at the dome show on 1/4/2011 I have to say that this match was not as impactful as those. ~ Pre-Match Build: New Japan’s newest gaikokujin has already made a statement by attacking Kojima at the final night of the NJPW USA Invasion tour and was soon announced as a part of Suzuki’s Army (Suzuki-gun). Kojima was pretty much left without nothing following Suzuki’s appearing and taking everything he had put together with TAKA and Taichi turning their backs on Kojima. Kojima and Makabe have since formed a strong unity, after spending the last few months beating the crap out of each, but you got to suspect that Kojima is looking for revenge and will be aiming for Suzuki’s head. Archer though will be the wild card in this match. Archer has spent time all around the USA and is more famous for his time in WWE as Vance Archer and in TNA as Lance Hoyt/Lance Rock. Archer is a big guy and I don’t think anyone will deny him that, and he could make his presence known as the potential big and powerful threat for Suzuki. ~ You would almost think Suzuki is at home in NJPW with as much cheers as he gets, but that also does not compare to the reaction that Togi Makabe gets as he is still one of the more over wrestlers in the promotion. Everyone did well in this match, pretty solid affair for everyone even, you know some would question my thought here, Archer does show he has a future in NJPW. He does have a lot of strength and agility for a big man and showed it well in this match. The main feud that will continue is the obvious Suzuki vs. Kojima as these two are far from done with each other. Pretty much a battle through and through and I enjoyed it the match. This match was pretty good with Suzuki and Kojima brawling, Makabe and Archer playing the power game, and in the end a descent introduction for Archer who liked I said is now open to the Japanese fans. MVP has found himself in a never ending war with Yano that revolves around the Intercontinental Championship. Yano believes he should have been the first champion, while Yano believes that MVP should have never appeared in NJPW. This match was alright in the end. Do not know if there is a complete miss between these two, but if anything Yano does do well with working as the heel. MVP shows some skill with being the stronger of the two. There was just a few moments that felt more unnatural than should have actually been more clean. ~ Bad Intentions have proved Tokyo Sports and many others that they “are” the strongest tag team in Japan, and they have a chance to add to that accolade by also becoming double tag team champions. Takayama and Sano though will be a touch challenge for the gaikokujin IWGP Tag Team champions. Takayama is known as being one of the toughest Japanese wrestlers still wrestling today as with Sano backing him up they have held a solid reign in NOAH taking on all the teams that were put in front of them. This match should be one to watch as only one team will walk out with both belts and with their heads higher as they know that they are the strongest tag team in Japan today, if not the World. ~ This match was good and accomplished what it meant to accomplish, make one team known as the best in Japan (and possibly the World). I can tell you one thing after seeing this though that I would not mind seeing some more of Bernard and Takayama facing off against each other in the ring. Two of the biggest in Japan right now going at it is not a bad thing in my opinion. Anderson looked descent as well in this match and even had some solid moments over the bigger Takayama. Sano on other hand was just as he usually is Sobat and Sobat kick. The double stomp, after double stomp. It does sort of take away from the match, but also I felt this match could have had a bit more length to it. But again time constraints and maybe it is just a bit different to see shorter frame matches? Hiroshi Tanahashi and Hirooki Goto have always been rivals in the ring, ever since Goto became a Heavyweight wrestler him and Tanahashi has always met face to face in the ring on many occasions. In the past Tanahashi has always appeared to be one step higher than Goto and sort of labeled himself as the better man of the two. Though those matches remain in the past and their meeting on 6/18 may mean more for Goto this time around than any previous time. Goto as many of you know has had his glory by winning the G1 Climax in 2008, and consecutively the New Japan Cup Tournaments back to back in 2009 and 2010. But when it came to the big prize of the IWGP Heavyweight Championship it has eluded him everytime. Now it brings us to the Dominion show back in May of this year, Tanahashi successfully defended the IWGP Heavy belt against Shinsuke Nakamura and in his normal fashion was celebrating the victory. Hirooki Goto, fresh off of spending a month in Mexico, appeared and stepped into the ring to look at Tanahashi face to face. Tanahashi though had a different idea and practically started telling Goto to leave the ring ang back to the back, which comes from all the times where Tanahashi has beat Goto. Tanahashi this year more than any I have personally noticed he has become way to sure of himself, a bit to arrogant for his own good. This is what sets up Tanahashi as Goto did not take to kindly of Tanahashi talking down to him and dropped Tanahashi to the mat with a solid headbutt to the jaw. The crowd immediately began Goto, but that also may be because they really didn’t see what Tanahashi really did to set up the attack? Anyways Goto got what he wanted and now has probably one of the more significant title opportunities of his career. Goto has always played second best to Tanahashi over the years, and after the “headbutt that rocked New Japan” Goto has the chance to either prove his worth to Tanahashi or eat every last bit of criticism that comes his way. It is more of a lose-lose situation for Goto. If Goto wins he solidifies himself as one of the best in New Japan, if he loses he ends back down at the bottom of the talent pool. Tanahashi though as I mentioned has come of arrogant and downright disrespectful to Goto, and for him a win of Goto will do nothing but feed that ego, but a loss you would think would make Tanahashi regain some composure and realize that he is not so untouchable as he has thought. I mentioned that this match is definitely going to be the must watch of the show, and it most certainly delivered that and more. Though some may point out a few spots in this match that were botches, but hey stop nitpicking unless you are a professional wrestler and say you can compete on a level that these two. This match I can say is probably the best encounter between these two that we could see. Lot’s of new variations on moves, with these two knowing each other so well it made very a very strong encounter and match. There is times when you think both men are done and that it is over, but they get right back up and start it up again. [93%] ~ This is where I sit the match right now, definitely solid and deserves to be up there as Match of the Year Candidate. I have to call this the most solid show from NJPW this year so far. I enjoyed every match that was offered and nothing really came off bad. I definitely recommend that you pick up this event from IVPvideos.com when it is made available to the general public. Definitely a must see for anyone looking to get a start in viewing anything from Japan.